As time goes on, you may find that you are earning more money than you were previously. Congratulations! That's a good thing. Unfortunately, new income often means new spending. You use higher paychecks to boost your standard of living with a bigger house, pricier cars, more costly meals, and luxury items. This is called lifestyle creep. The problem with lifestyle creep is that things can crash down on you if your income drops. And it's not particularly easy to dial back your cost of living quickly. Sometimes we just don't realize how much we are spending. We spend unconsciously, assuming that we're not doing anything different from what we've done in the past. We pay our credit card bills without reviewing them, barely glancing at the record of what we purchased in the previous month. This lack of attention can gradually lead to lifestyle creep. If you begin a practice of tracking every dollar and reviewing that record on a regular basis, you'll recognize where you're making careless spending choices, and you can do something about it. Reviewing credit card bills and bank statements is a good way to start. There are also online tools such as Mint.com and Personal Capital that allow you to aggregate accounts and see all your income and spending in one view. This goes hand-in-hand with tracking your spending. It's important to be aware of how you are spending your money. Try to get in the habit of making purchases deliberately rather than impulsively. When you intend to buy an item, ask yourself questions like, "Do I really need this?" and, "Can I get this for a better price?" Do extensive research before buying any large items. In this day and age, there's plenty of information available online about any product. 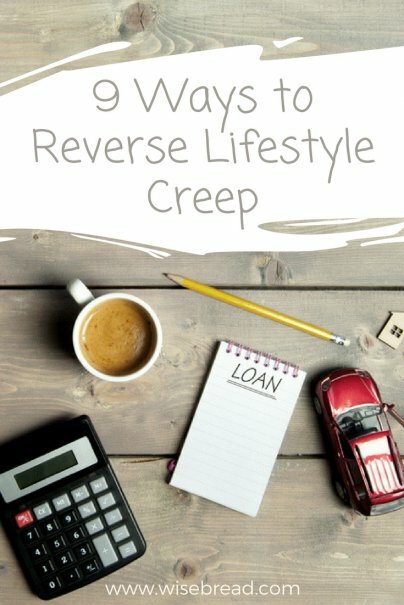 Lifestyle creep happens when you start spending money on things you want rather than things you truly can't live without. You need food and shelter. You need school books for the kids. You don't need cable television, designer clothes, or vacations in Bali. You don't need Netflix, no matter how much you've convinced yourself that you do. Reducing lifestyle creep is not about bringing spending down to zero, or even purchasing the cheapest version of any item you buy. It's about spending money in the most efficient way possible. When you seek to make purchases that are a good "value," it means you are trying to find the perfect balance between quality and price. Let's say you need a new refrigerator. You found one at the store with the lowest price, but the reviews suggest it has poor reliability and uses too much energy. Meanwhile, you may have found a fridge that's highly-rated in terms of quality, but its price is three times higher and has features and components you don't need. The best value fridge for you is somewhere in the middle. Finding value can come into play with any purchase, from homes, to cars, and even college educations. If you have a 401(k) plan, you are allowed to contribute up to $18,500 each year to help you save for retirement. If you have an IRA, you can contribute up to $5,500 annually. In both cases, you can contribute even more if you are over 50. It should be your goal to hit these maximum contributions. It's hard to hit these limits when you are young and perhaps not making a lot of money. But as you earn more, it becomes possible. If you set a goal of maxing out these contributions, you are more likely to put any new money you get into retirement accounts than spend it. One of the ironic things about being financially responsible is that companies will make it easier for you to spend more. Credit card companies will keep your interest rate low, thus making it easier for you to borrow. They will raise your credit limits so you can more easily buy big-ticket items. If this happens, you must avoid the temptation to spend more just because you can. It's also just as important to avoid any special efforts to expand your purchasing power, unless you have a dire need to do so. If you have a couple of credit cards with reasonable credit limits, be content with what you have. If you have a $5,000 credit limit on one card, there's no need to request a $10,000 limit just because you can. That extra $5,000 will simply serve as a temptation to spend money on items you don't need. You've heard the term keeping up with the Joneses. You may have a neighbor or friend who always seems to be getting the newest thing: a new house, a new car, expensive camps, and top-of-the-line sporting equipment for the kids. It is common for people to expand their lifestyle to keep up with friends and neighbors, and they may not even realize they are doing it. Whether we realize it or not, there are billions of dollars being spent every day in an effort to get you to part with your money. Commercials on television and radio, ads on the internet, and even social media posts are all working to get us to buy products and services. Granted, this is part of how capitalism and free markets work. But we don't need to fall victim to it. It's possible to avoid making unneeded purchases simply by become more cognizant of when companies are advertising. Your buying decisions should be based on your needs, and timed according to when you are most comfortable. It's important to be stoic, even cynical, in the face of marketing efforts. As our life circumstances change, we are often forced to accept trade-offs. But we often make the wrong trade-off from a financial standpoint. We purchase a larger, more expensive house and are willing to forgo retirement savings to make it work. We accept high monthly payments and credit card debt as a trade-off for driving two brand-new cars. Life is about trade-offs, but financial freedom is about making trade-offs that benefit your wallet rather than your ego. You desire to maximize your retirement accounts, so you are willing to avoid the $5 daily coffees to help make it happen. You don't want your children saddled with student loans, so you're happy driving the Honda Civic with 200,000 miles on it. You don't want to increase your mortgage payment, so you invest in bunk beds instead of a new house when your second kid is born. These kinds of trade-offs prevent lifestyle inflation from creeping in and taking control.